Our Solo Hiking Adventure – Where are we Going? You are here: Home / Life With Dogs / Our Solo Hiking Adventure – Where are we Going? Finally! The 15 day forecast is showing me the weather through Monday, September 28th. Why is that important? Because I have been WAITING to see what the weather was going to be like over the weekend that Gretel and I will be going on our solo backpacking trip. I knew when we were going for sure but I didn’t know where. That was weather dependent. Our trip will be four days and three nights. If the weather was going to be cold and rainy in Western Washington, we were going to head east of the mountains. I wasn’t super excited about that though. Although I appreciate the desert, I wanted to see trees, moss, mountaintops and maybe some mushrooms. Finding a trail on the east side was also going to be a challenge because a large part of that area has burnt up or is still on fire. Now, some of you may remember that I declared I was going to hike Section J of the Pacific Crest Trail with Gretel earlier this year. That was going to be a 7-day trip. But then, because an error in information I was given, the distance doubled to 72 miles. I just shrugged my shoulders at first at the idea of hiking alone with Gretel for 12 days but then I had a reality check. While we were on the trail to Gem Lake for an overnighter, I realized that I am in no way prepared to spend 12 days in the woods alone… especially on a trail with no access for a quick escape if something went wrong. I decided it was smart to scale back my plans and tackle the 12-day adventure next year. Now I was faced with deciding where where to hike since my original plans were derailed. I figured we can cover 7-10 miles in a day so we could cover 28-40 miles on our 4-day trip. I needed to find a trail of that length that was also dog friendly. I also wanted to avoid an out and back hike if at all possible. I was looking for something in the Cascade Mountains and I wanted spectacular views. Given those constraints, I wasn’t coming up with a lot of options when I searched the Washington Trails Association website. It looked like I was going to have to bust out the paper map and make up my own route by connecting established trails. I thought about hiking a loop on the Olympic Peninsula that I had hiked the entirety of in day trips. Safe but boring. Somewhere in the Eastern Washington desert was going to be our only option if the weather was going to be crappy on the west side of the Cascades. I decided that just because I couldn’t hike all of Section J this time, hiking a section of the Pacific Crest Trail near Snoqualmie Pass was still an option. I finally settled on a half-loop route that will take us from the Kachess Campground, up to Park Lakes, by Glacier Lake, up to Chikamin Peak, and along the infamous Kendall Katwalk to Snoqualmie Pass. It’s about 35 miles including the side trips. I didn’t look at a lot of pictures of the area because I didn’t want to spoil it but here is the Kendall Katwalk area to give you an idea of what it looks like. As I said, the decision was very much dependent on the weather forecast. When I looked last week it was going to be sunny and in the mid 70’s in that area. Things were looking good for us! Then things changed for the worse. At first, it changed to cooler temperatures and one partly rainy day. Then it changed to one day likely to have heavy rain and one that would be partially rainy. However, there was still going to be more sun than clouds on those days. I looked this morning and there is just under a 50% chance of light rain for two days and the temperature high is predicted to be only in the mid to high 50’s for all 4 days. The night temperatures are predicted to be around freezing. Honestly, this weather is about at the edge of my comfort zone. It IS Washington and it IS the mountains so the weather doesn’t always follow the predictions. It could very well not rain at all on our trip…. or it could rain more than is predicted. I don’t mind hiking in the rain, and Gretel is pretty good with it too, but if she gets wet I will need to keep an eye on her for hypothermia since it will only be in the 50s. So, at this point it’s a gamble. It’s a gamble I’m still willing to make. I still feel comfortable and safe with my decision. There are still three full days before our trip though and the weather forecast could continue to change. I’m going to need a plan B in case it gets worse so off to REI I go this morning to look at maps. I have a couple of ideas but I need to check the routes on a topographic map. While I respect your concern, I think it’s a little judgmental. Every dog is different. It’s true that this kind of trip is not for every dog – regardless of size – but it is not poor judgement for me to bring Gretel along. 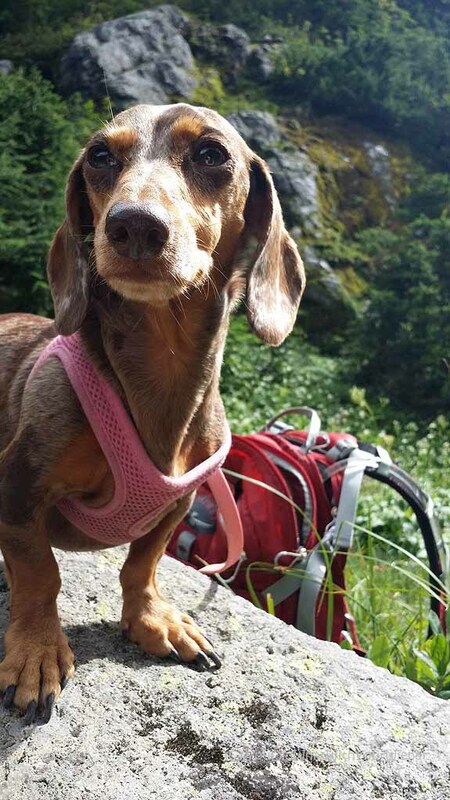 Poor judgement would be taking my 13 old Dachshund along with me who has hiking for years and could make it but would be sore for days afterward. Poor judgement would be hiking 20 miles in a day with my dogs, which I know they could do but it would be extremely taxing on them physically. My dogs have been hiking since the day they lived with me (12 years for Chester and 5 years for Gretel). Not only have they built up a lot of stamina but I am very, very aware of what their limitations are. It’s not poor judgement to bring a dog along that 1) I know loves it and 2) has the energy and stamina to do it. I think your plans are awesome and very inspiring. I have 4 little hikers I’d love to take on an extended trip. Mine don’t have the stamina, nor do I… but we would work on that if it ever becomes a reality! I can see where both of you are coming from. I think that as long as you know your pet’s limitations and does not push her beyond it just for your fulfillment, you’re all good. Since you have been doing this for a long time, I think you are responsible enough to keep Gretel safe throughout the trip. You take care now and have fun! Thanks for your vote of confidence. I admit that it is a very fine line between pushing them for your own fulfillment and taking on a challenge that is totally within your dog’s capabilities. I’ve spent a lot of time trying to learn where that line is and I think I have a pretty good handle on it. Ooh, this sounds like fun. What better way to spend that amount of time than hiking with your dog? Wonderful girl time. So cool. I’ll be looking forward to hearing about your travels. Woo-hoo! Awesome trip! Take lots of pictures and I hope the weather cooperates. I am so excited about your trip and following along. This is something that I’d love to do, but I know that I’m not cut out for it. But renting a cabin for a few days would be fun. Good luck! Wow, what fun!! Take lots of pictures and I can’t wait to see them! This sounds like an amazing adventure! I hope you and Gretel have a blast! I cannot wait to hear about it and see all the photos. Hopefully the weather cooperates too! I’m very excited to hear your tales when you and Gretel return from this amazing adventure – impressed and jealous! We’re back! We came home a day early but everything is ok. I’ll share more in my blog posts about it. So excited to see your pics and posts when you get back! We are doing a backpacking trip soon, too. So excited! I didn’t take as many pics as I thought but I did get some great ones. It was really cold and I was exhausted every day so taking a lot of photos was not at the top of my list. Ha, ha. I’ll be sharing some this week and then probably more next week. It was so great meeting you this morning at Ridge Lake. Hope to see you again. ! It was great meeting you too. I love spontaneous encounters with strangers like that. It’s what life is about. Well, as long as they are good anyway and you seemed pretty sane. Ha, ha. Maybe I will run into you on the trail again or we can plan a hike. I am considering doing the Maple Pass Loop on the 5th. I’ve never done it before and the weather is supposed to me amazing.